Hi there! Today I’m sharing a review for a contemporary YA novel form Cori McCarthy. 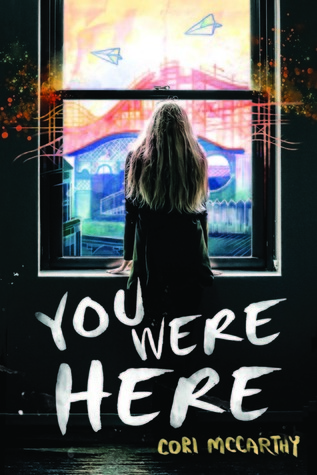 YOU WERE HERE is a page-turner for no other reason but to watch a trainwreck of grief tear through the lives of several teens. I had terrible thoughts that this would turn out tragically, but I was spared that by some amazing moments of grace and introspection, and, well…hope. This was a tough book to read, because there are so many elements of grief and depression. That said, it really pulled me in, and I liked how it all worked out. Jaycee Strangelove is a girl in crisis. Her beloved daredevil of an elder brother Jake died five years ago, challenged to a parkour feat he’d completed a thousand times before–but not while drunk, maybe. In an instant he was gone, but his loss created a ripple effect which still has power. Those waves are beating Jaycee’s sanity to pieces. Her best friend, Natalie, an unknown witness to the event abandoned her not long after Jake’s death. Ryan, a selective mute and Jake’s good friend, has tried to get over his role in the tragedy–and his long-time crush on Jaycee. In the wake of Natalie and Jaycee’s high school graduation they reconnect, as Natalie and her boyfriend Zach and another friend, Bishop, discover Jaycee’s intent to recreate some of Jake’s stunts/adventures. Ryan is a silent witness to the ordeals, providing the kind of assistance he wished would have saved Jake so many years ago. This is a book that’s told by five voices–and each is a person dealing with loss. The summer after graduation should be filled with big plans and parties and fun, but it’s not like that for this motley crew. They are instead “urbanex”-ing–exploring abandoned and derelict urban structures for fun. Jaycee has a map and journal used by her brother before he died, and she wants to visit each space to be in a place he once was. It’s a dangerous pastime, and results in more than one serious injury. While Jaycee hunts for the fleeting connection with her idolized brother, she puts herself and others at risk, time and again. This recklessness is what keeps Ryan coming back–he can’t bear to let Jaycee hurt herself, and she’s barely got a grip on reality, as it stands. Her mother has been in and out of in-patient therapy since Jake died, and Natalie’s a sometimes there, yet completely messed up, Type-A gal seeking a future her mother outlined. Jaycee’s father tries to hold things together, but he’s stretched so thin, and really just wants his family to heal. In the meantime, there are several other issues, including teen substance abuse, domestic abuse, and love. Yes, love, because it exists within all these real spaces. A whole lot of truth-telling is the order of the summer, and seeing the end of the journey together, too. The adventures create an intimacy that can only exist for people who have long histories and shared pain. As outwardly self-destructive as Jaycee is, the same experience exists for Natalie and Zach–only inwardly. Bishop’s coming to terms with a bad relationship/break-up is just as gut-wrenching for him, and Ryan, well Ryan needs to be real with Jaycee before he doesn’t have a chance. It took me a little time to bond with the characters, but there are some excellent voices here, and the presentation of each was stunning. Expect some graphic novel-type elements–which were wholly unique and enjoyable to me as a novel reader. I also loved the story and its resolution. Grief is such a soul-sucking experience, and it has the ability to ravage each of us in very different ways. The book was excellent at demonstrating it’s varied and destructive power while still bringing the reader, and characters, back to a hopeful place in the end. Interested? You can find YOU WERE HERE on Goodreads, Amazon, and Barnes & Noble. I received a review copy of this book via NetGalley. You can find Cori online on her website, Facebook, and twitter.